Home » creative » Food n Beverage » Giant » offline contest » POKKA » purchase » slogan » spend » vouchers » WhatsApp » POKKA "Peraduan Beli, Hantar & Menang" Contest! 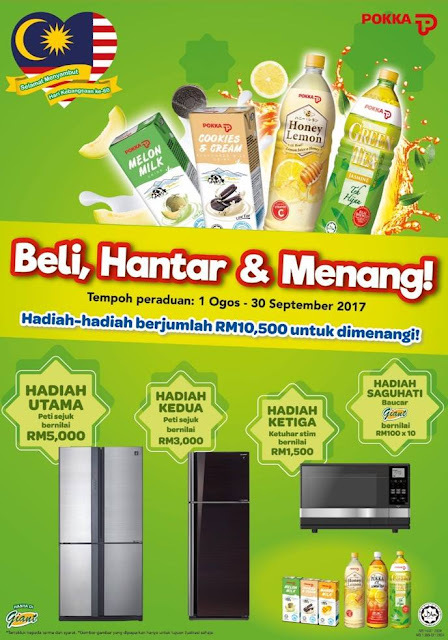 POKKA "Peraduan Beli, Hantar & Menang" Contest! Spend a minimum of RM12 on any POKKA product in a single receipt at any Giant supermarket. Get the Contest Form from Giant's Customer Service counter, fill up the form, attach your receipt and mail it to the address written on the Contest Form. Keep your receipt as a prove of purchase when you redeem your prizes. Visit POKKA "Peraduan Beli, Hantar & Menang" contest terms & conditions for more details.